--> The ERA-CVD funding organizations wish to promote multi-disciplinary work for Early Career Researchers in different countries to build effective collaborations and interchange on common research projects. The European Advanced infraStructure for Innovative Genomics (EASI-Genomics), a project funded under the European Union’s research and innovation programme Horizon 2020, will provide researchers free-of-charge access to cutting-edge European genomics facilities. EASI-Genomics joins 16 academic and industrial partners to support diverse genomics project from study design, over state-of-the-art sequencing to bioinformatic analysis. EASI-Genomics is an infrastructure project with a total budget of 10 million € that will handle between 150 and 300 projects over a period of 4 years. Ivo Gut from the Centro Nacional de Análisis Genómico of the Centre for Genomic Regulation (CNAG-CRG) coordinates the project. More information and the call application forms are available here. Proposal submission to proposals(at)infrafrontier.eu by 30 April 2019. Interested in discovering the landscape of Translational Medicine? Want to learn about the job profiles of scientists in Industry? Then join the 2019 Winter school "Translational Medicine Explained (TMex)" which will be held in the beautiful Palau Macaya in Barcelona from November 11th – 15th. The fee of 450 Euro includes the 5 day course in Barcelona, catering during the course, one dinners and the e-learning. For more information see here. Review of application documents will be on a first come, first serve basis. A multi-stakeholder taskforce set up by the CORBEL consortium (WP3) is developing procedures to provide the scientific community with access to individual patient-level data (IPD) from clinical trials. Access to IPD would ensure data quality and robustness of analyses, improve the accuracy of estimates of benefits from a treatment, and optimise the use of clinical trial data for re-analyses, secondary analyses and meta-analyses. With publishing an ‘Evaluation of repositories for sharing individual-participant data from clinical studies’, a taskforce sub-group has now made an important contribution to the implementation of clinical study data sharing: they analysed existing data repositories using an indicator set to capture the maturity of the repositories’ procedures and their suitability for the hosting of IPD. Their analysis gives an overview about the currently available repositories and can actually help researchers to find a suitable repository for their datasets. Main objective of this INFRAFRONTIER2020 Trans-national Access call is to facilitate access for the wider biomedical research community to the unique infrastructure and scientific expertise of the participating INFRAFRONTIER mouse clinic, where mouse mutant lines can be tested through phenotyping pipelines with special focus on metabolic functions. Proposal submission to proposals(at)infrafrontier.eu by 15 April 2019. EMBRC-ERIC has recently appointed Dr. Nicolas Pade as new Executive Director. Read more about it here. The INFRAFRONTIER / IMPC conference 2019, taking place in Finland´s beautiful capital Helsinki on 3 to 5 June, will be focussing on Genetic Variation, Big Data and Ageing – three top prerequisites for a sustainable success of the upcoming era of precision medicine. First details on the conference agenda can be found on the INFRAFRONTIER website. Registration is possible via the website. Oral or poster presentations may be offered to the organizers at INFRAFRONTIER and the Finnish host, BioCenter Oulu. Pancreatic cancer is one of the most lethal forms of cancer, and there is a strong need to be able to identify it at an early stage in order to start a treatment as early as possible. The challenge of identifying predictive biomarkers for the early stages of pancreatic cancer was tackled by scientists from Leiden University Medical Center, the Erasmus Medical Center in Rotterdam, the University of Tartu, the National Institute for Health and Welfare in Helsinki and the HUNT Research Centre in Levanger by making use of biobanked samples from five large European population cohorts. The work, which was funded by BBMRI-LPC and CORBEL (WP 3 - Medical/Translational Research Use Cases), was now published as a preprint on bioRxiv. During the upcoming 12th International Computers, Privacy & Data Protection (CPDP) Conference with the focus on Data Protection and Democracy, BBMRI-ERIC organised a panel about 'The impact of the GDPR on health research practices' on 1 February 2019 in Brussels. The panel aimed to assess the practical consequences of the GDPR for data sharing within the EU with regards to biomedical research, especially biobanking. A recording of the session is now available on YouTube. What do patients and citizens think about the issue of sharing individual participant data (IPD) from clinical studies? By means of a survey among patients and citizen groups in Italy, scientists around Cinzia Colombo and Rita Banzi from the Istituto di Ricerche Farmacologiche Mario Negri IRCCS addressed this question and recently published the results in BMJ Open. Half the groups who responded were aware of the debate about sharing individual participant data from clinical studies and several had an official positive position. Many supported broad access, asking for conditions important for building trust in entities that handle IPD sharing. The work was partly conducted in the context of the CORBEL WP3 activities that produced a consensus document about sharing and re-use of individual participant data from clinical trial, published in December 2017. The latest issue of the CORBEL newsletter is out! Read here about the Open Call for research projects, Instruct-ERIC in the spotlight, reports from the Medical Infrastructure/Users Forum meeting and the ‘Best Practices in Biomedical Public-Private Research Collaborations’ workshop, updates from our partners and more! Subscribe here if you want to stay informed about what's happening in CORBEL. On 31 December 2018, the CORBEL 2nd Open Call for research projects was finally closed. Since its launch in March 2018, it generated a lot of interest among European scientists: 23 project applications from academia and industry covering all of the five offered Access Tracks were received. From all eligible projects, 13 applications were finally accepted as CORBEL user projects after undergoing a thorough scientific and technical review, and the latest applications are still being evaluated. The users now have the unparalleled chance to access the requested high-end technologies and services at more than 20 service providers from 10 European biomedical research infrastructures in order to advance their projects. Most of the user projects already took up their work – the time frame is rather tight as the service provision has to be completed until the end of the CORBEL project in May 2020. All projects will receive continuous support by the CORBEL Open Call project managers during the access phase as needed. The experience gained with the user projects will directly inform CORBEL’s strategy to establish an enduring foundation of collaborative scientific services for biomedical research in Europe and embed the combined infrastructure capabilities into the scientific workflow of advanced users. ECRIN is looking for a Project Manager (Clinical Research / Medical Devices). Read more about it here. Main objective of this INFRAFRONTIER open call is to facilitate access for the wider biomedical research community to the unique infrastructure and scientific expertise of the participating INFRAFRONTIER partners, to deliver novel mouse lines and rat mutant models that will advance knowledge of human disease and will be of widespread use in biomedical science. Recent advances in genome editing technology will be used to develop new mouse models of human disease. INFRAFRONTIER will provide open access to all newly developed disease models through the European Mouse Mutant Archive (EMMA). Access to this free-of-charge-service will be granted on the basis of the applicant’s research plans and the potential impact of the proposed novel mouse line on the wider biomedical research community. This Trans-national Access call of the INFRAFRONTIER2020 project supports a total of 12 precision mouse model development projects. A complementary call provides support for 3 customised rat model development projects. More information and the call application forms are available here (mouse models) and here (rat models). Proposal submission to proposals(at)infrafrontier.eu by 15 February 2019. INFRAFRONTIER is the European Research Infrastructure for phenotyping, archiving and distribution of model mammalian genomes. The INFRAFRONTIER Research Infrastructure provides access to first-class tools and data for biomedical research, and thereby contributes to improving the understanding of gene function in human health and disease using the mouse model. The core services of INFRAFRONTIER comprise the systemic phenotyping of mouse mutants in the participating mouse clinics, and the archiving and distribution of mouse mutant lines by the European Mouse Mutant Archive (EMMA). from 11-15 March 2019 at EMBL-EBI, Hinxton, UK. In this 5-day workshop, we will dive into the topic of biological data visualisation and how it can be used to gain insight in and get a "feel" for a dataset, so that targeted analyses can be defined. This course is targeted at biologists who want to explore, and gain further insight, into their own data through the use of visualisation and design approaches. More information and the registration link is available here. Register now to secure your place! Applications close 25 January 2019. One of the INFRAFRONTIER2020 project aims is to develop pilot platforms and services supporting microbiome research. A service to derive germ-free (axenic) mice is now provided by three infrastructures with a long standing expertise and track record in the derivation of axenic and gnotobiotic mice, namely the Axenic / Gnoto Facility of the Instituto Gulbenkian de Ciência, the Karolinska Institutet Core Facility for Germ-free Research, and the CNRS Service Isotechnie of the PHENOMIN-TAAM infrastructure. The participating INFRAFRONTIER infrastructures are among very few dedicated facilities in Europe who have the required equipment and expertise to generate germ-free and gnotobiotic mice. All infrastructures routinely offer their services to external users. The participating axenic- and gnotobiology platforms support research into host-microbiota interactions to study the role of the microbiome in both health and disease. This has been the subject of extensive research and established the involvement of the microbiome in metabolism, nutrition, physiology, and immune function and showed that mammalian microbiota play crucial roles in the pathogenesis of many diseases. Access to the axenic service will be granted on the basis of scientific excellence and supports pilot projects for the derivation of-germ-free mice. Further breeding and characterisation of axenic mice or the development of gnotobiotic models can be offered on a fee-for-service or on a collaborative basis. More information and the call application form is available here. Proposal submission to proposals(at)infrafrontier.eu by 31 January 2019. CORBEL 2nd Open Call - FINAL APPLICATION DEADLINE 31 December 2018! The CORBEL Open Call for research projects is going to close finally on 31 December 2018. Applications from companies are especially welcome in this last submission round of the Call. Both SMEs and large enterprises can get support to move their R&D project a step forward. Special information for industrial R&D projects is given on the website focusing on applicants from industry. The European Open Science Cloud (EOSC) was officially launched on 23 November 2018 in Vienna. The event highlighted the importance of the EOSC for European research and introduced the new EOSC Portal which provides access to data, services and resources and through which users and service/resource providers can engage with the EOSC. 1) SAMPLE – where researchers can request PDX models for their research from our newly developed EurOPDX Data Portal. Then, if selected, they would receive aliquots of a PDX model that has been engrafted and grown in NSG mice, quality controlled according to the high standards of EurOPDX, and delivered alongside its PDX passport containing all important accompanying information. 2) DEPOSIT – where researchers can request the deposition of their own PDX models within our distributed EurOPDX RI biobank, and displayed within our newly developed public repository, the EurOPDX Data Portal. Proposals that are selected for this type of access grant will have their PDX model health-checked, engrafted and grown in NSG mice by one of the EurOPDX RI node institutes, aliquoted, quality controlled according to the high standards of EurOPDX, then biobanked within the EurOPDX RI and displayed within the EurOPDX Data Portal for increased visibility to facilitate its further use by the wider research community. The Scientific Infrastructure Management at the Max Delbrück Center for Molecular Medicine (MDC), Berlin (Germany), is seeking a Project Manager to join and coordinate the MDC's activities of CORBEL. The application deadline is 23 November 2018. More information can be found here. EATRIS and NEURATRIS are offering a series of webinars on Neuroimaging in November and December 2018. The series will cover the usage of CEST-MRI, optical imaging and PET imaging in neurodegenerative diseases and their potential application in translational medicine. The webinars will take place on 6, 20 and 27 November and 4 December 2018 from 14:00-15:00 CET and are free of charge. The neuroimaging webinars include an audience Q&A session during which attendees can ask questions at the end of the lecture. Please note that all webinars will be recorded and available for later viewing. More information is available here. Main objective of this INFRAFRONTIER2020 Trans-national Access call is to facilitate access for the wider biomedical research community to the unique infrastructure and scientific expertise of the participating INFRAFRONTIER mouse clinics, where mouse mutant lines can be tested through specialised metabolic- and behavioural phenotyping pipelines. Disturbed energy balance regulation results in obesity and in numerous related metabolic disorders such as type 2 diabetes mellitus. We offer specialised phenotyping pipelines comprising state-of-the-art test assays monitoring disease related parameters. In-depth behavioural phenotyping supports the elucidation of the molecular and genetic basis of behavioural impairments that are relevant for human neuropsychiatric disorders such as anxiety disorders, post-traumatic stress disorder, depression, schizophrenia, autism, attention-deficit hyperactivity disorder, Parkinson’s and Alzheimer’s Disease. Proposal submission to proposals(at)infrafrontier.eu by 15 November 2018. INFRAFRONTIER is the European Research Infrastructure for phenotyping and archiving of model mammalian genomes. The INFRAFRONTIER Research Infrastructure provides access to first-class tools and data for biomedical research, and thereby contributes to improving the understanding of gene function in human health and disease using the mouse model. The core services of INFRAFRONTIER comprise the systemic phenotyping of mouse mutants in the participating mouse clinics, and the archiving and distribution of mouse mutant lines by the European Mouse Mutant Archive (EMMA). During the course of the INFRAFRONTIER2020 project a total of 2 Trans-national Access calls supporting 15 specialised phenotyping projects will be published. One further call with a focus on functional immune-phenotyping screen by mass cytometry, and on induced secondary phenotyping screen under acute or more chronic inflammatory conditions will be released in spring 2019. ERINHA is recruiting its full time Director General, place of work will be Paris. Deadline for applications is October 19, 2018 (17:00 CET). For more information see the vacancy note. A paper on reproducible genomics analysis pipelines (PiGx) for the analysis of RNA-seq, ChIP-seq, Bisulfite-seq, and single-cell RNA-seq was recently published by the group of Altuna Akalin from the Berlin Institute of Medical Systems Biology at the Max Delbrück Center for Molecular Medicine. Their work was partly supported by CORBEL. Congratulations to the authors! The position of a Project Manager is open at the Finnish Euro-BioImaging node. More information can be found here. On 1 September 2018, the current submission round of the CORBEL 2nd Open Call for research projects started. Industrial and academic scientists are invited to submit their proposals to access technologies and services offered by the European biomedical research infrastructures. Please be aware that all interested researchers are required to talk about potential applications with the contact person(s) at the prospective service providers before submitting their project proposal. The current submission round will close on 31 October, 2018. For more information visit the Open Call webpages and find separate information on applications from industry. The CORBEL Innovation Helpdesk team in conjunction with the EATRIS Slovenia National Node and the University of Ljubljana is organizing a best practice workshop on the theme of public-private collaboration on 12-13 December 2018 in Ljubljana, Slovenia. Registration is open - please find more information in the Event announcements. If you have questions or require further help please contact the Innovation Helpdesk. Deadline for applications is September 14, 2018 (17:00 CET). Publication: "Mind the Gap: From Tool to Knowledge Base"
From ELSI to Knowledge Base - the latest paper published by CORBEL WP7 leader Michaela Th. Mayrhofer (BBMRI-ERIC) and Irene Schlünder from TMF e.V. provides an overview of the activities and results toward a comprehensive ELSI support for the biomedical research infrastructures. The work was co-funded by the Horizon 2020 projects ADOPT BBMRI-ERIC and CORBEL. The full text of the paper is available here. TRANSVAC is a collaborative infrastructure project funded by the European Commission (EC), designed to accelerate vaccine development by enhancing European vaccine research and training, and increase sustainability of EC vaccine projects by implementing a permanent research infrastructure for early vaccine development. The next deadline for applications for services is 15 August 2018. More information can be found here. Registration for the 5th CORBEL Medical Infrastructure/Users Forum (MIUF) meeting (15 October 2018, Paris) is now open. Please find more information in the Event announcements. In the course of a recent grant agreement amendment, the European Commission approved the cost neutral extension of CORBEL until the end of May 2020. The consortium is very grateful for the chance to extend and expand its efforts to support European biological and medical research by harmonising user access to biomedical research infrastructures, unifying data management, creating common ethical and legal services, and offering joint innovation support! During the second submission round of the CORBEL 2nd Open Call for research projects, several applications were received and are now being evaluated. Due to the rolling deadline of the Open Call, researchers are now encouraged to submit their proposals during the third submission round. The third submission round will close on 31 August, 2018. For more information visit the Open Call webpages. The first submission round of the CORBEL 2nd Open Call for research projects closed on April 30, 2018. The evaluation process has started and applicants will be notified about the outcome of the evaluation soon. As the Open Call has a rolling deadline collecting applications at the 1st of every 2nd month, researchers are now encouraged to submit their proposals during the second submission round. The second submission round will close on 30 June, 2018. On 26 March CORBEL launched its 2nd Open Call for research projects. This call offers all academic and industrial scientists in Europe the unique chance to accelerate their research by using state-of-the-art technologies and services from more than 20 facilities from 10 different research infrastructures. The first submission round will close on 30 April, 2018. Scientists at the Helmholtz Center Munich (HMGU) have identified a network of genes that could play a vital role in the development of metabolic diseases such as diabetes. The study for which INFRAFRONTIER provided the research infrastructure marks a substantial progress in the fight against diabetes: In order to identify candidate genes for the wide spread metabolic disease, the research team of the German Mouse Clinic (GMC) examined `knockout mice´ – each lacking a specific gene – for metabolic dysfunction. Cooperating with a worldwide group of colleagues in the International Mouse Phenotyping Consortium (IMPC), the scientists discovered a total of 974 genes whose loss had strong effects on glucose and lipid metabolism. The functions of 51 of these genes in the mouse were hitherto completely unknown. The genes were similar in their structure: Many of them had common genetic elements. Compared with genome data collected in humans, 23 genes appeared to play a role in human diabetes. Read more here. As a follow-up to the consensus paper published end of 2017, ECRIN-ERIC released their publication on Classification of processes involved in sharing individual participant data from clinical trials. It is accessible from here. ERINHA is looking for a Scientific Project Manager, place of work will be Paris. Deadline for applications is February 6, 2018. CORBEL WP3, lead by ECRIN-ERIC, published a consensus paper on data sharing of data from clinical trials. The publication can be accessed here. The report "IP issues in Open Science, pre-competitive Research and Open Innovation", produced by the CORBEL innovation specialists (CORBEL WP8), is now online available. BBMRI-ERIC is hiring a Systems Administrator, being responsible for supporting all office operations regarding IT and the infrastructure operations of Common Service IT. The full-time position is located at Central Executive Management Office of BBMRI-ERIC in Graz (Austria). For detailed information see the vacancy note. Transnational Access Call "Precision mammalian model development"
Main objective of this INFRAFRONTIER open call is to facilitate access for the wider biomedical research community to the unique infrastructure and scientific expertise of the participating INFRAFRONTIER partners, to deliver novel mouse lines that will advance knowledge of human disease and will be of widespread use in biomedical science. Recent advances in genome editing technology will be used to develop new mouse models of human disease. For more information visist the INFRAFRONTIER website. The CORBEL Catalogue of Services offers an overview on what kind of services (access to samples and technologies, data, tools, expertise etc.) can be accessed from the participating research infrastructures. Researchers from academia, clinics and industry working on a complex project often do not have access at their home institution to the cutting-edge technologies they would need to boost their research – especially these researchers can benefit from utilising a research infrastructure. The catalogue includes state-of-the art services from the fields of advanced imaging technologies, biobanking, clinical trial, databases, functional genomics, marine model organisms, microorganisms, pathogenic microorganisms, plant phenotyping, screening and medicinal chemistry, structural biology, systems biology and translational research. Searching the catalogue, researchers do not only obtain an overview on available services, they also receive information on access modes, costs and much more. Planning a complex research project it is also possible to use services from different research infrastructures subsequently. Examples of such service pipelines are given on the website. 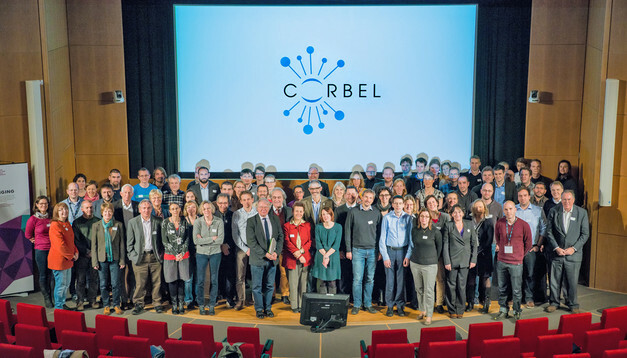 End of October the CORBEL consortium met for its 2nd AGM in Amsterdam (The Netherlands). All participants spent two exciting days, being updated on latest project outcomes and discussing the next steps for their workpackages. On October 24, 2017 the CORBEL Medical Infrastructure/Users Forum (MIUF) met in Amsterdam to continue the discussion on a better cooperation between medical research communities, medical RIs and funders. 5th Instruct Internship programme 2017 open! Instruct's internships funding has two components: One component covers travel and subsistence expenditures for the fellow up to 6000 Euros. The second component is a regular Instruct Access Project associated to the internship, contemplating a maximum expenditure of 6000 Euros (equivalent to 4 access visits). For more information and the call submission guidelines please visit the Instruct website. The call closes November 11, 2017 at 17:00 CET. During the FEBS 2017 Early Bird Session 3 (September 12, 2017), the three European Research Infrastructures Euro-BioImaging, EU-OPENSCREEN and Instruct-ERIC will not only present how external scientists from Europe and beyond can use their technologies and services and how scientists can integrate them in their research projects, they will also inform the audience about the opportunities arising from CORBEL. Within CORBEL, the 13 RIs established a network of quality managers, in order to harmonise quality management approaches across the biological and medical RIs. Recently, a framework for quality management (QM) in the biomedical research infrastructures (BMS RIs) has been published, defining a core set of principles in QM all 13 RIs will be compliant with. The publication is accessible here. Both support the Central Executive Management Office. The EMBL-EBI is looking to recruit a scientist to support our work for the CORBEL project. The role is to work directly with scientists from around Europe in their use of our chemogenomics resources (particularly ChEMBL), to progress their research projects and to develop training programmes. Deadline for application is July 31, 2017. More information here. At a Royal Society awards ceremony celebrating the prestigious new European Commission-approved status for structural biology Instruct Research Infrastructure, UK Minister for Universities, Science, Research and Innovation Jo Johnson recognised the value and relevance of collaborative work between the UK and European scientists. Instruct is a pan-European partnership giving researchers vital access to advanced instrumentation and the necessary training. The equipment is typically very expensive and requires specific technical experience. Technology and infrastructure are at the heart of the revolution to connect atomic resolution of molecular structures with functionality at the cellular level, and technical advances are constantly pushing the science forward. The new legal status for Instruct transforms it into a European Research Infrastructure Consortium (ERIC), joining 16 others across Europe. As the second UK-hosted ERIC, Instruct will provide the European structural biology community with continued access to high-quality, stable and sustainable services. Over the past four decades, European researchers have played a pivotal role in developing increasingly sophisticated technologies including super-powerful cryo-electron microscopes. Instruct has been supported since its inception by the Medical Research Council, on behalf of the UK as the host country. Instruct provides access to some of the most sophisticated methods that allows researchers to generate images of molecules at near-atomic level, in far greater detail than was previously possible. This detail allows them to understand how the molecular machines in our bodies work and determine the building blocks of proteins, viruses and cells. Cryo-EM, one of the key technologies at the forefront of the structure revolution, is allowing researchers to better understand how diseases, like Alzheimer’s disease, affect the brain, and how specific molecules involved in causing disease might be targeted with drugs or vaccines. Minister Jo Johnson was able to announce at the event new multi-million pound funding for further cryo-EM facilities in UK, some of which will be available through the Instruct Centre UK, located in Oxford and the Harwell Research Campus. This investment combined with the new status of Instruct-ERIC, will enable the best and brightest minds across Europe to continue to share knowledge and state-of-the-art equipment, to advance discovery science and improve human health. 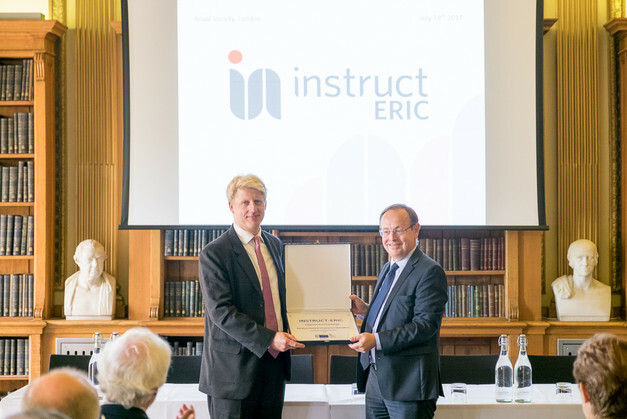 For more information about Instruct-ERIC, please visit their website. The BBMRI-ERIC Assembly of Members recently appointed Erik Steinfelder as the new Director General of BBMRI-ERIC. He will begin this position on 1st August 2017, succeeding Professor Jan-Eric Litton. For detailed information please visit the BBMRI website. The European Commission adopted the Instruct-ERIC decision on the 4th July 2017; Instruct is the 17th ERIC to be adopted. The Instruct-ERIC award ceremony takes place July 18, 2017. For more information please visit their website. Innovation by Open Access Meeting - presentations online now! Co-organised by the CORBEL partners Medical University of Graz and EATRIS-ERIC, this meeting provided useful indications on how Research Infrastructures (RIs) can boost innovation. After short presentations from the RIs, introducing themselves, various speakers from European Commission, Industry and other European organisations explored the theme of Open Innovation with particular emphasis on pre-competitive research collaboration models. All presentations given at the meeting are online available. In it's last meeting, the CORBEL Executive Board approved that ERINHA and EMPHASIS join the CORBEL consortium. With both RIs on board, CORBEL now unites all 13 bio-medical sciences RIs of the ESFRI roadmap. The CORBEL consortium is looking forward to fruitful cooperations! ERINHA Research infrastructure, currently under preparatory phase, enters into implementation phase from July 2017. Since then, ERINHA will operate under AISBL legal statutes. ERINHA has been conceived to reinforce European research capacities in the field of study of highly infectious emerging and re-emerging diseases bringing together European high containment laboratories and complementary facilities. ERINHA aims to provide a coordinated transnational access to its state-of-the-art BSL4 and complementary member research capabilities and expertise to relevant scientists from academia and industry. It will contribute to more efficient national, European and global preparedness to outbreaks and enhance European capacities in the field of pathogenic agents to prevent and respond to the spread of epidemics with high impact on health, economy and society. EMPHASIS	aims	at	the	development	of	an	integrated	European	phenotyping	infrastructure	able	to	test	genotypes	in	current	and	future	agro-climatic	scenarios	and	provide	services	such	as	access	to	diverse	facilities	under	controlled	and	field	conditions. An	integral	part	of	the	EMPHASIS	strategy	is	the	link	of	data	acquisition	to	European	data	management	approaches	as	well	as	to	crop	models	simulating	performance	in	current	and	future	climatic	scenarios. Additionally,	EMPHASIS	will	develop,	evaluate	and	disseminate	novel	technologies	that	can	be	used	beyond	plant	sciences	and,	provide	new	opportunities	to	European	stakeholders	from	academia	and	industry. Webinar "User Experience Design for more user-friendly applications"
The next event in the CORBEL webinar series takes place June 27, 2017 at 15:30 CET. Click here for more information and registration! "How European Biological and Medical Sciences Research Infrastructures boost Innovation by Open Access" - this question is addressed during a workshop organised by WP8, taking place June 20, 2017 in Brussels. Participation is free of charge, but participants have to register. For detailed information about this meeting clicke here. EATRIS-ERIC is hiring a Scientific Director, for more details click here. Closing date for receipt of applications: June 9, 2017. For more details visit the CCMAR website. For more details visit the INFRAFRONTIER website. Innovation Helpdesk: new guidelines online! The CORBEL consortium launched its call for hosts for its staff exchanges program. This program is for operational staff from the Research Infrastructures participating in CORBEL to develop operational expertise in four areas – data management, service provision, innovation and ethics – by making short knowledge-exchange visits to other Research Infrastructures (RIs) that are noted for their excellence in the same area. The staff exchanges form an integral part of CORBEL’s WP9 tasks. Within WP3 a questionnaire was created to collect the needs and expectations of medical research communities and overall users regarding the services offered by research infrastructures. The responses have been collected and analysed and will be used as input to gather recommendations for continuous improvement and development of new, transversal services. The full report can be downloaded here. has announced the launch of the Paediatric Clinical Research Infrastructure Network (PedCRIN). The three-year project brings together ECRIN and the founding partners of the European Paediatric Clinical Trial Research Infrastructure (EPCT-RI) to develop capacity for the management of multinational paediatric clinical trials. Children represent 20% of the European population and their health is a major societal challenge for Europe and the world, requiring the development of evidence-based paediatric medicines and treatment strategies. Yet, there is a current lack of data specific to neonates, infants and children; over 50% of the medicines used in these groups have not been tested on them specifically, but rather, on adults. This is problematic as neonates/infants/children and adults differ widely in many ways, from their physiology to their metabolic pathways. It is thus important to conduct paediatric trials to increase the knowledge base to develop appropriate, safe and effective health interventions for neonates, infants and children. However, there are various challenges to paediatric studies including dosage and form, recruitment, and many ethical concerns (informed consent, exposure to molecules while still developing, etc.). Therefore, the management of paediatric trials requires the highest level of ethical standards and scientific rigour. Through PedCRIN, ECRIN aims to address the above challenges to paediatric trials. This will be achieved by bridging paediatricians and other partners across Europe (and internationally) to combine resources and expertise to conduct and manage robust studies, while minimising risk and protecting the child participants. The three-year PedCRIN project involves five work packages, including project coordination and implementation; definition of the PedCRIN business strategy and governance structure; development of tools specific for paediatric and neonatal trials (trial methodology and (patient-centred) outcome measures, adverse event reporting, bio-sample management, ethical and regulatory database, monitoring, quality and certification); provision of operational support to selected pilot trials, which will be coordinated by ECRIN with the support of national paediatric coordinators hosted by paediatric networks (that currently exist or are being set-up); and communication targeting user communities (including industry partners) and policymakers, and aiming to empower patients and parents. ‘Through PedCRIN, we hope to develop the necessary tools and capacity to enhance the high quality and ethical standards of multinational paediatric clinical trials. These tools will be tested through the project, refined, and then shared by the European and international scientific community, ensuring that the project gains become sustainable’, said Jacques Demotes, Director General of ECRIN. PedCRIN has received funding from the European Union’s Horizon 2020 programme (INFRADEV-3 call) under grant agreement number 731046. Main objective of the INFRAFRONTIER open call is to facilitate access for the wider biomedical research community to the unique infrastructure and scientific expertise of the participating mouse clinics. Mouse mutant lines can be tested through a broad based primary phenotyping pipeline in all the major adult organ systems and most areas of major human disease. Access will be granted on the basis of scientific excellence and supports the development and in depth characterisation of new mouse models for investigating gene function and human pathophysiology. INFRAFRONTIER will provide open access to all newly developed disease models and phenotyping data. The purpose of RItrain Staff Exchanges is for managerial staff from European Research Infrastructures to learn from managerial and leadership best practices in areas that are new to them, or that they feel their research infrastructure needs to develop specific expertise in, by making exchange visits to research infrastructures that are noted for their excellence in selected areas. Update: Please note that the deadline for submission of applications to the “Stakeholder Management and Community Building” module was extended to January 31, 2017! 2nd ENVRIplus call for proposals for multi-disciplinary access to Environmental Research Infrastructures open! ENVRIplus (Environmental Research Infrastructures providing shared solutions for Science and Society) is a European Horizon 2020 project bringing together Environmental and Earth System Research Infrastructures, projects and networks together with technical specialist partners to create a more coherent, interdisciplinary and interoperable cluster of Environmental Research Infrastructures across Europe. Deadline for submission of applications is February 24, 2017. For more information please visit the ENVRIplus website. On 01 December 2016, Kees de Ruig (EATRIS and CORBEL’s Innovation Office) was part of a panel discussion at the BioFIT conference in Lille with the titel “How can deal-making process be accelerated by standardised contracts and conditions?” Other panelists were Lorraine Sautter (Inserm) and Paul Hermant (Bird & Bird) and the session was chaired by Nicolas Carboni (Conectus). From the session it was clear that many Technology Transfer Offices (TTOs) struggle with contracting with external parties. It is not always easy to negotiate terms and conditions, and in order to ensure consistency as well as to improve quality and reduce timelines, the use of templates is highly recommended. Especially in case multiple projects are conducted with different partners in consortia, the use of a Master Research Collaboration Agreement is very instrumental. The good news is that TTO’s don’t need to reinvent the wheel; many resources are available including the Lambert template agreements. Additionally, the Innovation Office of CORBEL provides templates and guidance, as well as ad hoc consultancy. The innovation office can be reached at innovation [at] corbel-project.eu; more information can be found on the website. Job vacancy at BBMRI-ERIC: the research infrastructure offers the position of the Director General, starting August 1, 2017. Place of work is the Central Executive Management Office in Graz, Austria. Closing date for receipt of applications: 17:00 CET, 17 February 2017. For more details click here. The 1st CORBEL Open Call is closed. Thank you for the great interest! Submitted proposals will be evaluated now and applicants will be contacted directly by the Open Call management team. On 5 October CORBEL launched its 1st Open Call for research projects. This call offers all academic and industrial scientists in Europe the unique chance to accelerate their research by using state-of-the-art technologies and services from more than 80 service providers. Project application can be submitted until 30 November. RIs play a pivotal role in the advancement of knowledge and technology, and represent a powerful instrument to promote, facilitate and enhance regional, national and transnational collaboration through shared access to facilities. Close collaboration with medical research communities is needed to ensure appropriate development of tools and services, and to ensure that researchers across Europe have open access to these resources, facilities, services and data. Through this questionnaire, the BMS RIs aim to capture the needs of research communities, in order to foster collaboration with research infrastructures across Europe and to develop specific or common services. As a potential RI user, your input in this questionnaire is extremely helpful. Please note that the survey (click HERE to access) will be closed on Monday, July 25, 2016. Euro-BioImaging (EuBI) is the European research infrastructure for biological and medical imaging. Recently, EuBI started its Interim Operation, i.e. its services are now open for researchers across Europe. European life science researchers now have the possibility to use state-of-the-art imaging technologies, which they do not find at their home institutions or among their collaboration partners. For more information please visit the Euro-BioImaging website. Where do you get support with ELSI questions around data and biosamples? This questionnaire aims to assess if the tools and platforms you use in relation to your ethical, legal and societal issues are informative for your daily work and which questions are yet to be answered. To offer the right service, we need your insight, please take the effort and respond by June 26, 2016. The survey can be accessed here. CORBEL partner BBMRI-ERIC, together with ESBB (the European, Middle Eastern & African Society for Biopreservation & Biobanking), organises the first Europe Biobank Week taking place September 13-16, 2016 in Vienna (Austria). The Europe Biobank Week is the new platform for a strong debate and collaboration on activities related to biobanking and biopreservation of samples and data for R&D. The focus of this first Biobank Week is on "Biobanking for Health Innovation". More information about the Europe Biobank Week can be obtained from its website. Today we are pleased to announce the launch of the CORBEL Innovation Office, intended to provide advice and assistance to streamline research collaboration among Europe’s BioMedical Research Infrastructures (RIs) and the industry. The CORBEL Innovation Office aims to increase the utilization of research data and resources through enhanced collaboration and reduced length of matching and negotiation processes. At the CORBEL Innovation Office, a team of experienced business developers and legal experts will be available to answer questions and give advice to CORBEL RIs on data sharing, partnering and deal making, with a special focus on public-private partnerships. In addition, the Help Desk will share best practices from the RIs and make available online guidelines and template agreements for frequently occurring situations within public-private collaborations. The service will soon evolve to include novel collaboration models such as Open Innovation and Expert Centres for sharing data and resources in the pre-competitive phase. The Innovation Office team will work closely with related CORBEL work packages in the fields of joint user access (WP5), regulatory and ethical aspects (WP7) and education and training (WP9). On March 10, 2016, the European Strategy Forum on Research Infrastructures (ESFRI) presented the 2016 ESFRI Roadmap on Research Infrastructures during a one-day conference in Amsterdam. All eleven research infrastructures participating in CORBEL are placed on the roadmap: BBMRI, EATRIS, ECRIN, ELIXIR, INFRAFRONTIER and INSTRUCT are labelled as ESFRI landmarks while EMBRC, EU-OPENSCREEN, Euro-BioImaging, ISBE and MIRRI listed as ESFRI projects on their way to full operability. The 4th ERIC Networking Meeting is co-organised by EATRIS-ERIC and takes place March 8-9, 2016 in Amsterdam. For details please visit the EATRIS website. The EU project RItrain launched a survey addressing training needs in management and leadership of research infrastructures (open until February 9, 2016). The survey can be accessed at surveymonkey. The results of this survey will be used to shape a training programme that is tailored to these needs. The start of this process will be a back-to-back series of workshops on February 16–18, 2016, organized by CORBEL and RItrain. For detailed information about the workshops please visit the RItrain website. On November 19, 2015 the official CORBEL Kick-Off Meeting took place, hosted by ELIXIR at the Wellcome Trust Centre in Hinxton (UK). CORBEL brings together 11 ESFRI BMS biological and medical research infrastructures with the objective to establish common approaches across these infrastructures for user access, data management, ELSI (ethical, legal and societal implications) and innovation. A significant proportion of the project is dedicated to support advanced user projects that cover the full range of biomedical research – from the fundamental understanding of molecular mechanisms to the outcome from clinical trials. By supporting several pilot projects from different user communities that need access to more than one infrastructure, CORBEL will map and address bottlenecks in the accessing and combining research infrastructure services. The envisaged framework of shared services will overcome these bottlenecks and foster research and development in the life-sciences. For 2016, a priority will be to link CORBEL’s data management efforts with other standardisation efforts globally. A second priority will be to bring together ELSI approaches across research infrastructures. Furthermore, several pilot projects will be identified and initiated. More general information about CORBEL as well as details on the planned pilot projects can be obtained from this newly launched website or by following the CORBEL Twitter account (@CORBEL_eu; #lifescienceservices). Today the CORBEL cluster projects starts! The main objective of the project is to establish a collaborative and sustainable framework of shared services between the ESFRI BioMedical Sciences research infrastructures (BMS RI). This project receives funding from the European Union’s Horizon 2020 research and innovation programme under grant agreement No 654248.